I just pushed live a new version of my company. 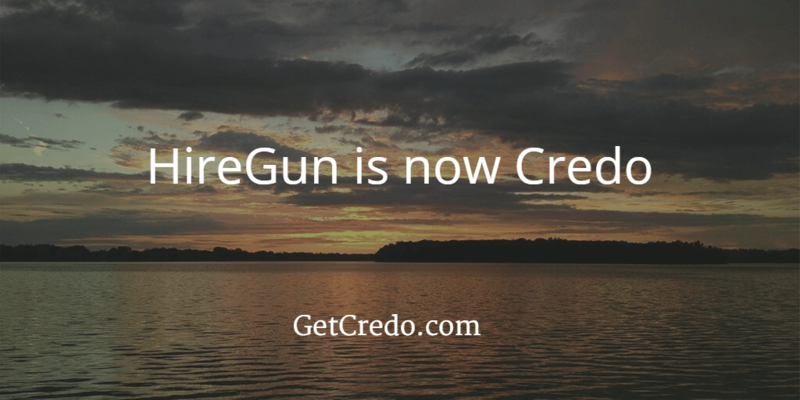 Formerly known as HireGun, moving forward the name is Credo and you can find it at GetCredo.com. Let me tell you why. Why change the name of a company that is, for all intents and purposes, just a few months old? If it’s not broken, why fix it? Well, the answer is that the name HireGun was broken and I had to fix it. Getting laid off from Trulia forced my hand at becoming an entrepreneur (more on that in another post). A few issues have forced this rebrand earlier than I expected. The forcing mechanism is a cease-and-desist that I received the day before Thanksgiving that told me that I was violating a trademark. This is true and I am not trying to hide it, but rather admit that it’s a rookie entrepreneur mistake that I made and have had to learn from. Because of it I feel like I have lost at minimum a couple of weeks that I could have spent pushing the company forward. Ouch. At heart, I knew he was right, as are the others who have mentioned similar things to me. So with the forcing mechanism and the desire to build a brand that I am excited about and proud of, instead of something I named three years ago when I was a very different person, today the new branding has gone live and I couldn’t be happier to have the last chapter behind me and to be looking forward to the next one. I’ve also learned a few very important lessons along the way as an entrepreneur and businessman. HireGun launched at the beginning of 2013 as a simple website. At that point in life, I was not as tuned in to many of the cultural concerns around us. HireGun was a fun name that had an available domain name, so I bought it and launched. If you’re not embarrassed by your first version, you launched too late. I’m embarrassed. Three years on, I am no longer able to avoid the fact that the name is tone-deaf with everything going on in America today. The current political climate around us and constant shootings in America today have led me to not only become more politically active myself, but also to desire to disassociate myself and my business from anything gun related. Violence is bad business. I know I’ll likely get hate (ironically) for that statement, but I can’t stand behind something that could condone violence. The gun issue aside, HireGun is a very male-gendered name. I have actually found it challenging to make HireGun an inclusive brand largely because of the brand name. I’m an advocate for increasing diversity in the workforce and especially in technology, so a brand name that leans very “male” will not serve my purposes long term. During the course of finding a new name, I actually ran some Google Consumer Surveys, one for men and one for women, to find a name that resonated equally. This was surprisingly hard to do and there were a few contenders, but Credo is one of them that resonated strongly with both. While I may have preferred to use the one that came out on the very top, I was unable to because of another trademark that exists. While this is only a small part of making a difference in the world, it’s important to me that the name be as gender-inclusive as possible. Credo fits that. Before you start a business, make sure that the name is not already trademarked or copyrighted. Believe me, there is nothing worse than investing in your business and starting to see it take off only to have to rebrand it when you’d much rather be investing in growing it than not getting sued. I will leave my personal thoughts about how broken the trademark system is for another day, but right now let’s talk about the process I went through. First, brainstorming a new name that means something, has an available domain name and social media profiles, and doesn’t infringe on a trademark is remarkably difficult in the marketing space. For example, did you know that someone has the term [marketing advisor] trademarked, which means that I couldn’t use the word [advisor] in my name? I went through about seven iterations of domain names, including purchasing six, before I found GetCredo.com. Second, spend time familiarizing yourself with the Trademark search system. It’s called TESS and is incredibly hard to navigate. Eventually I learned about International Classes (ICs) and that made it easier to narrow down my search because I could run searches like [(credo)[COMB] and 035[IC]] that allowed me do searches quicker than a generic brand search. If your name isn’t trademarked within the International Class that you are operating within (in my case, 035), then you can use that term. Third, get a good attorney. I belong to LegalZoom, which allows me to schedule appointments with attorneys of many different types, including trademark attorneys. I don’t recommend paying for LegalZoom’s trademark search because you’ll likely go through multiple name iterations and could end up spending a lot of money unnecessarily. The last few months haven’t been fun. Alongside having this rebrand hanging over my head I’ve also had some consulting clients, plus the holidays were a time to unplug and try to recharge a bit before hitting 2016 hard. Being a solopreneur is actually way more isolating than I thought it was going to be. I have ~5 months of revenue runway built up, so I am cutting back consulting to focus on the Credo product and business. Credo currently does ~$5k in revenue each month, spending ~$600 per month. If I can grow revenue to $15k/month, I am not going back to consulting. I am attending Jason Calacanis’s Launch Festival at the beginning of March where I look forward to meeting a lot of other entrepreneurs and exploring financing options for my company. Looking to find or create a group of first time founders who have 5+ years of experience working (so probably over the age of 30) in San Francisco. So goodbye HireGun. You’ve been swell to me. And hello Credo. I’m looking forward to getting to know you. About me: I’m John Doherty, the founder of Credo. I’m a growth marketer by trade but now fully investing in my entrepreneurial passions. I live in San Francisco but travel often to other places, which you can follow on my Instagram feed. I’ve lived in SF (2 years), Brooklyn (2.5 years), Philadelphia (1 year), Northern VA (1 year), and Switzerland (2 years). Things I love outside of work: my wife Courtney, our black lab Butterbean, cycling, rock climbing, skiing, and being in community with others. Email me — john at getcredo dot com. With your positive outlook and attitude plus a dose of hard work it won’t be long before you’re hitting your targets! May I offer you one piece of advice? Take on someone to help you with the running/administration of the company asap – even if they work part time… once I cracked this it took my business to another level.